Coach Swatsworth truly believed his team could win several matches Thursday night against the visiting West Branch Warriors. Instead, his three “big dogs” won as usual, but everything else in the middle was a bloodbath. “We just couldn’t win those toss up matchers tonight” Said coach Swatsworth. Three wrestlers caught some bad luck, being pinned with under five seconds remaining in the period, a couple of them rolled over, and it seemed there was really only one good match worth talking about in the middle weights: Curwensville freshman Jake McCracken vs. West Branch freshman Ethan Yingling. 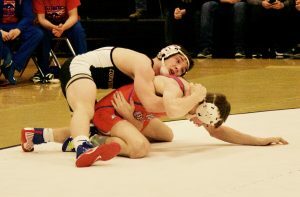 In their 152 pound bout, McCracken and Yingling wrestled a defensive match for five minutes, not taking shots, and each scoring from the bottom position. With the match tied at 2-2, both wrestlers finally began opening up, and in that short period of time there was some quality wrestling to be seen from both young men. Unfortunately, McCracken ended up in a headlock and was pinned with one second left in the final period. Before that, the match started at 126 where the Tide’s Mason Gasper lost a 14-4 major decision to Hudson Pase. After that, at 132 the first “big dog”,Zach Holland, returned the favor with a 9-1 major decision over Nikolaus Sample..
Coach Swatsworth also believed his team should have won matches the toss up matches at 138 and 145, but both of those matches turned into falls as well. 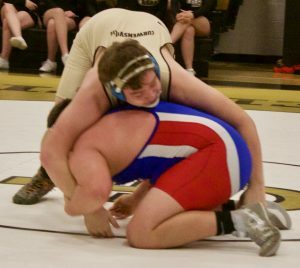 First, Caleb Stiles was pinned with 0.1 seconds left in the first period by the Warriors’ Hayes Jones, while Adam Straw at 145 allowed William Herring to dump him for takedowns five different times before he was pinned with five seconds remaining in the second period. “In some of those matches, we were just a move away from it favoring us. It just felt like we came out flat tonight.” Said Swatsworth. 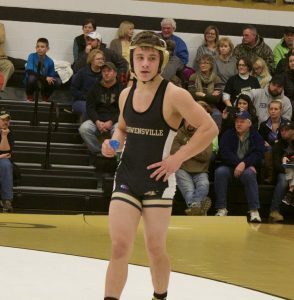 There were two more forfeits at 106 and 113 as usual for Curwensville, and then the final big dog, Blake Pasarelli took to the mat at 120 and wrestled a good match against another quality wrestler, Tyler Denochick. In that match, Pasarelli was able to get a takedown in the second period for the match’s only offensive points, and he fought off a last second headlock attempt for a 3-2 victory. “Blake wrestled well. Denochick is a quality kid and I think he did a real good job.” Said Swatsworth. Curwensville (3-10) is set for a good practice Friday, and then they travel to the Garrett Scott Invitational in Juniata on Saturday. Hopefully, they can start cultivating some new habits and be able to make a turnaround as they enter the final stretch of their season.